Cutloose Climbing: Dom the Tall! 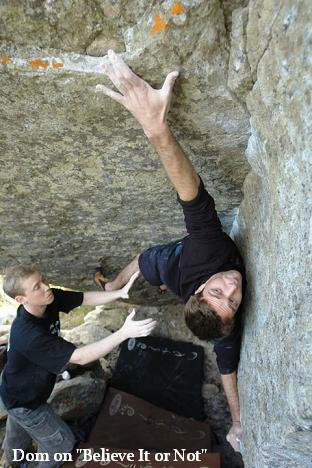 Dom Riordan has made the 4th ascent of the bizzare overhanging dihedral "Believe it or Not" 7C at Echo Valley in Topside. The problem was opened by Clinton Martinengo and originally graded 7C+, however the moves are fairly reach dependant and taller climbers have suggested a downgrade. Dom also made a repeat of the "Flaming Pig sit start" 7C at Redhill, commenting that it's relatively easy if you're tall, but desperate if you're short due to a foot lock that can be used by taller climbers on the hardest move.